Collectors deserve quality. They deserve accuracy. No judgement just scaled down exactness! There are multiple repainted OOAKS (one of a kind) by Noel Cruz. Above is a repainted and restyled Fairy Godmother from 2015's Live Action CINDERELLA . Ken Haseltine is an award winning creative Diorama builder. He specialized in 1/12th until someone encouraged him to try his hand at 1/6th. He has a store on eBay and also takes requests. Ken has hand crafted and recreated iconic Barbie structures such as the Barbie Shoppe and built a one sixth scale Barn for this collection. If you thought that no one could truly capture the essence, hair style or nuance of a smile, or the light emanating from within, then be prepared to be amazed. Noel has been recognized (world wide) for his painting abilities and his craft and recapturing celebrities. Visit his site for more of his work and to bid on upcoming eBay auctions. If you are an avid collector of just beginning the knowledge that has been amassed to date will be shared here. Including photography tips, the best sites to shop on line and what to avoid. There are a lot of great web sites where you can find the scale, for here it's mainly 1/6th sized items such as Monkey Depot, they specialize in military type toys but you can find everything from articulated Asmus horses to jeeps to a suit. Be sure to check out Integrity Toys web site for all things Fashion Royalty related. Seriously the best made fashions for the Ladies are on this site. There are also many groups that you can join as a collector such as Doll Observers which has a great web site and exclusive previews. Be sure check out Toys Amino which also is a great app for your phone and will really open you up to a huge diverse collection community. 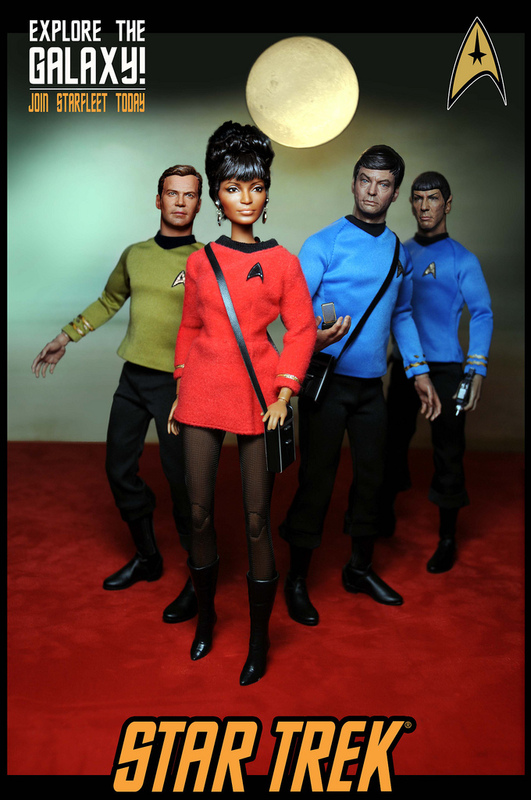 To the right a repainted and restyled Nichelle Nichols with a Star Trek away team. Want to get the magazine? February 1st 1Sixth Winter 2019 Issue: 1Sixth Winter Issue: Life Scaled Down. This magazine features OOAK Artists and Doll Companies. 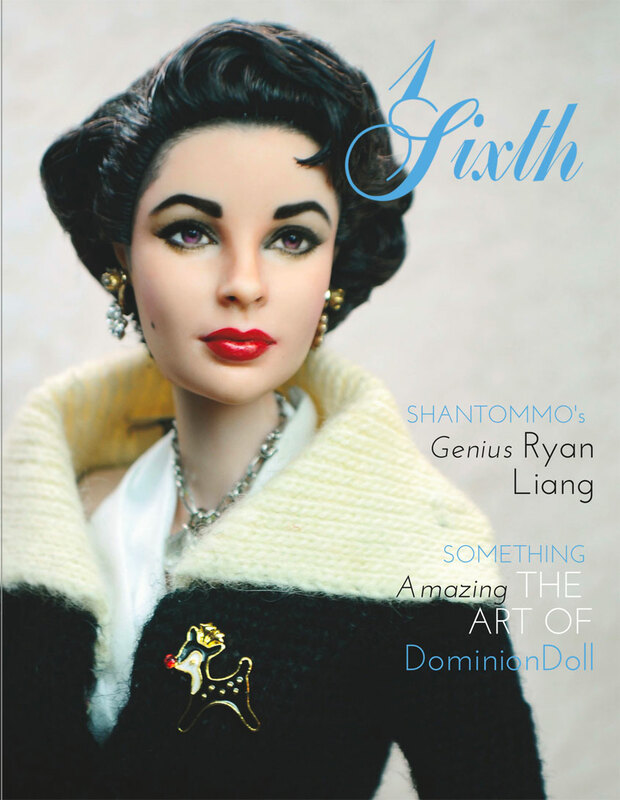 Featured in this issue: Dominion Doll, Noel Cruz, Regent Miniatures, Fashion OOAK Designer Ryan Liang of SHANTOMMO, fashions by ELEN PRIV, Antonio Realli, and other OOAK Artists Chan Sama of Plastic Guy/CGdoll, Pure Icon, Eggie & Deb and more! This issue features two covers, one is a commemorative issue with Farrah Fawcett on the Cover and an Inset page that debuted on February 2nd and the Elizabeth Taylor Cover from the 1st. The debut magazine for 1Sixth.co & 1Sixthworld.com is available through Blurb and iTunes and Apple Books! It debuted in January of 2018. This first magazine featured an exclusive interview & answer session with artist Noel Cruz (who specializes in repainted & restyled Barbie, Hot Toy, Tonner and other collectible repaints) with features and tips on photographing collections, posing and diorama artist & craftsman Ken Haseltine of Regent Miniatures. on iTunes and Apple books in addition to Blurb.